The storm is trending to nudge north with every update now. So for those that don't want snow in Columbus... It looks like we will be getting less snow than first thought and more rain for along I-70 and areas to the south. 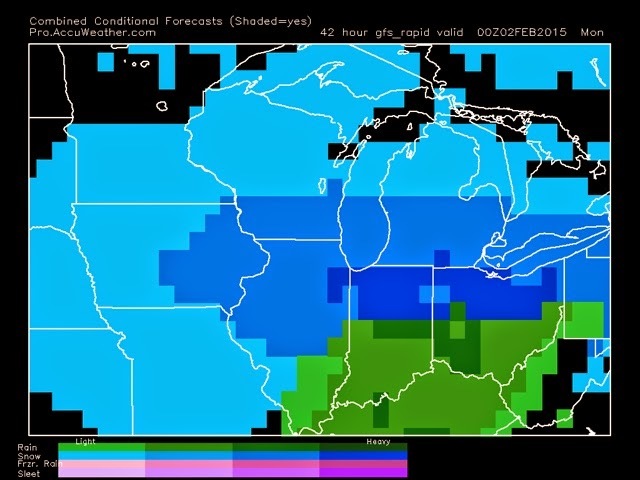 So this means areas that are rain will see MUCH LESS snow. Not only will you be seeing rain instead of snow at a certain time (afternoon/evening Sunday) but the morning snow on Sunday will be melted by the rain. So when I give snowfall totals I will be giving how much will be FALLING, not necessarily how much you will have by Monday morning. A couple hours of rain can melt a LOT of snow. NAM still is the most northerly model. It has very little snow for along I-70 and south for Ohio. 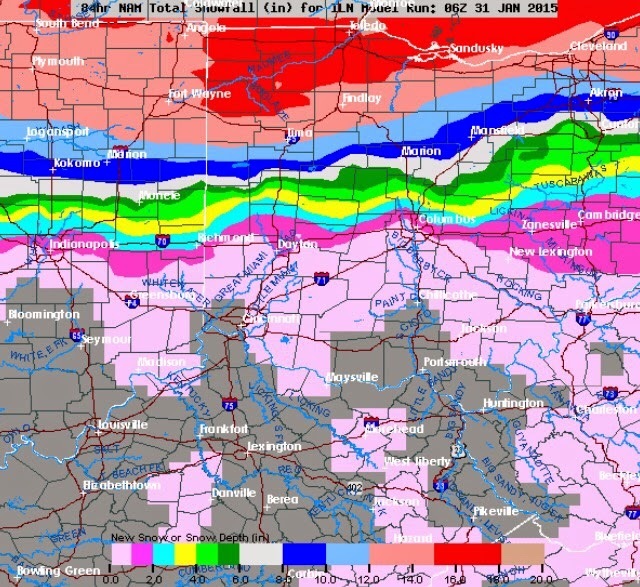 Then accumulations ramp up fast from I-70 to US 30... And then all snow north of US 30. GFS still has 2-5" for the I-70 corridor, but more north and less south. 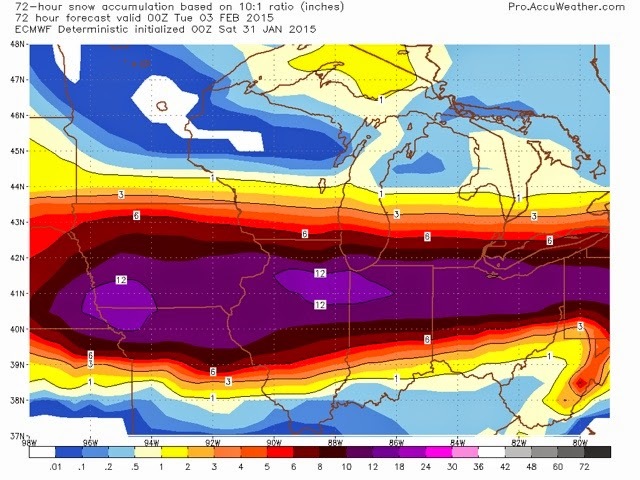 Euro still is the most aggressive and, in my opinion, not accounting for the warm air as much. Snow will start for all of us Sunday morning then the Southern half of Ohio will see the warm air move in for the afternoon and evening Sunday. It depends on where you live as to timing of the switch over. Then some light snow after we cool back down. 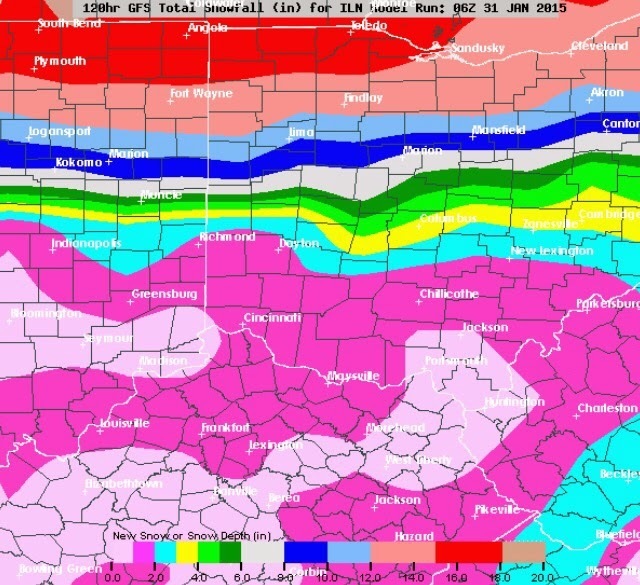 So the storm is still bringing the same amount of snow, but that snow has move more North. The subtle change in direction when it left the Rockies means our rain/snow line has moved about 80 miles in the last three days of forecast models... Plus keep in mind... While Columbus may see 2-5" of snow, once we switch to rain for a few hours much of that will be melted with only a little snow once we cool down enough for snow. I will have a much more detailed forecast map when I get into work this afternoon... Blogging this from my iPhone. No need to buy tons of bread and milk, but might not be a bad idea to get out some board games of you live in Northern Ohio. See us later today, and have a good one!